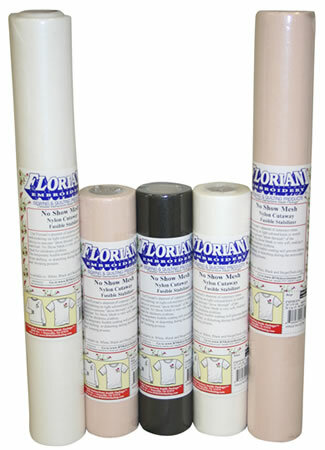 Floriani No Show Nylon Mesh Fusible is a 1.5 oz sheer cutaway embroidery stabilizer available in black, white and beige. Unlike traditional cutaway, Floriani No Show Nylon Mesh Fusible will not shadow through on light colored fabrics such as knits. Its softness makes it ideal for children's clothing and baby garments. The uniqueness of the fusible version makes this product a staple in your embroidery stabilizers. There is no need for basting or messy spray adhesives which leave a residue on the needle and machine when using this product. By fusing the stabilizer to the back of the garment, we are more successful in hooping and do not stretch the garment out of shape. No Show embroidery stabilizer is attached to the entire area where the embroidery will be stitched unlike spray adhesives which only "spot" tack and allow shifting of the fabric. This product is also available in a non-fusible version. Will support around six to eight thousand stitches on an average size, well-digitized embroidery design (4" x 4"). Use the fusible version to cover up scratchy stitches on the back of the embroidery. Will not shadow through on light weight cottons and knits. Fuse the entire piece of the stabilizer on to the back of the garment using a low temp, dry iron. (260°F, silk setting) When pressing the stabilizer on to the garment, the iron surface should touch the fabric, not the stabilizer. Important! If the design is denser than 6,000 stitches or if it is a poorly digitized design (too many stitches for designs size),"float" one layer of Floriani Medium Tearaway between the hoop and the bed of the machine for each additional 8,000 stitches for added support! After the design is complete the tear away can be removed leaving just the soft mesh against the skin. After the design is complete, remove the garment from the machine and embroidery hoop. To remove the No Show Mesh Fusible, re-heat the stabilizer and peel it back gently to the design and trim. *Tip! If embroidering knit, don't forget to use topping!